Web of Science: How many grains of salt are there in a teardrop? How many grains of salt are there in a teardrop? Of the various salts found in solution in bodily fluids, by far the commonest is table salt, or sodium chloride (NaCl). On average there is a little over 6 milligrams (mg) of NaCl dissolved in each millilitre (ml) of lacrimal fluid (tear fluid), i.e. a concentration of 6 mg/ml. One millilitre of water yields approximately 20 drops, and so there should be about 0.3 mg of salt in each teardrop. Table salt crystals are mostly cuboid in shape, with edges of about 0.3-0.5 mm. The mass of a cuboid grain of sodium chloride with edges of 0.4 mm is a little over 0.1 mg. Putting all this together, we come out at a figure of two to three grains of salt in each teardrop. This figure should be taken – well – with a large pinch of salt, since some of the quantities involved in the calculation can vary considerably. For example, the edges of salt grains are of varying length, and many grains are in fact not cuboid in shape. Another area of uncertainty lies in the number of tears to a millilitre. Lacrimal fluid contains proteins that serve to reduce the surface tension of the liquid, ensuring that the surface of the eye is well lubricated. The reduced surface tension means that drops of lacrimal fluid may be smaller than drops of water, and so more drops would be needed to hold the same quantity of salt. Finally, it should be said that there are salts other than just sodium chloride in tear fluid – potassium chloride (KCl), for instance, and sodium bicarbonate, or baking soda, NaHCO3. But as was mentioned earlier, the concentration of these salts is much lower than that of table salt (NaCl). 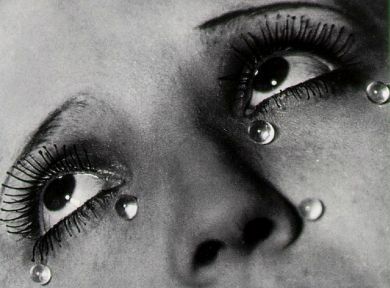 In the interests of science – and just for the fun of it – the author considered getting hold of enough lacrimal fluid to be able to carry out an independent assessment of the salt concentration in teardrops. For this, he would have required 10 ml of tears, and getting this quantity turned out to be easier said than done. So, regrettably, the answer given here is not based on independent experimentation. Már Björgvinsson. „How many grains of salt are there in a teardrop?“. The Icelandic Web of Science 5.3.2005. http://why.is/svar.php?id=4804. (Skoðað 21.4.2019).